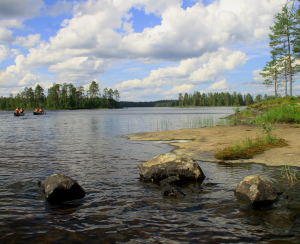 Finland is the only country situated almost completely inside the Taiga terrestrial biome. 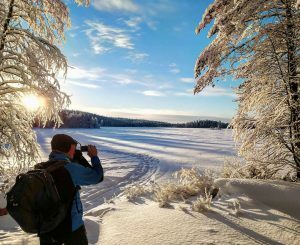 This allows us to witness the wonders of four completely different seasons and the huge contrast between them, from the warm nightless nights of the summer time to the embrace of the freezing pitch black polar nights of the midwinter. This is a real vantage point to follow the whole cycle of nature. Compared to other nations situated at the same latitude, Finland is relatively warmer thanks to the Gulf Stream flowing through the Atlantic Ocean and bringing us additive heat. At the same time, our climate is much more continental than in the other Nordic countries. This means that we don´t suffer as much from rain, hard wind and surprising weather conditions as our neigbors so planning and carrying out variable activities and trips is more convenient. The vigorous summer of this environment is something spectacular. The growing season is short but very intense due to the large amount of sunlight. 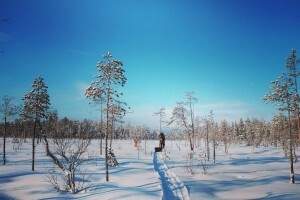 In Hossa, the snow melts around mid-May – June, July and August being the truly summery months with mean temperatures around +10 degrees Celsius. In June the rainfall increases but usually it´s just a couple of showers and then the weather changes again. From the beginning of September until the end of October/mid-November we face the nature that is preparing for the winter, it´s autumn time in Hossa. The temperature can be quite cool (0 – +10 degrees Celsius) and the weather in general a bit rainy and chilly before the permanent snow and the true winter. Fortunately the colors of autumn bring some contrast to the greyness. As the first permanent snow falls and the around five months lasting thermal winter begins in December, it illuminates the whole environment and creates a real winter wonderland. Ponds and lakes become frozen, the temperature can drop as low as -30 Degrees Celsius and the cover of snow can be up to one meter. The contrast between the seasons is signicant. Check out the blog and the photos to get a closer look!